Greenhouse growers now have access to two new products designed to better manage soil health, while controlling insect pests. 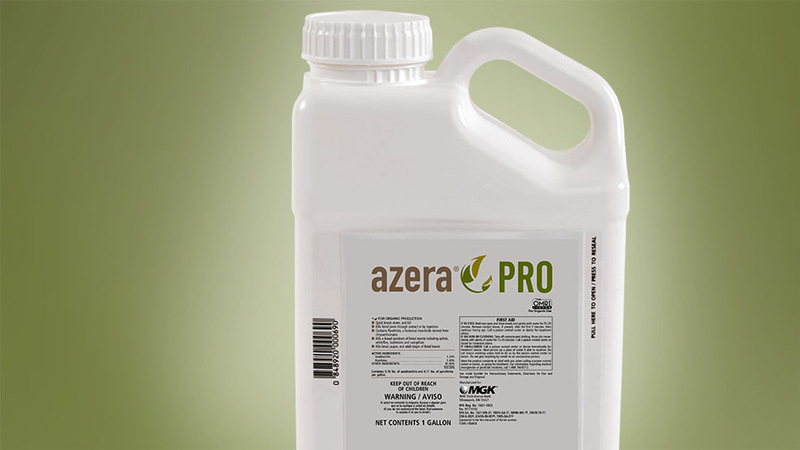 MGK recently debuted Azera Pro to the greenhouse, nursery, and landscaping industry, adding to the company’s organic botanical portfolio of solutions for insect control. Azera Pro is listed by the Organic Materials Review Institute (OMRI) and meets USDA’s National Organic Program requirements and complements other products already being used in the nursery and greenhouse industry. Azera Pro is designed for professional use against hundreds of insect pests in commercial greenhouses, nurseries, and landscapes. It delivers a one-two punch to quickly knock down and kill hard-bodied insects as well as the most pervasive soft-bodied pests by combining contact kill and insect growth regulator (IGR). Azera Pro is the latest addition to the MGK botanical portfolio and includes the combination of pyrethrins and azadirachtin. This combination of active ingredients has proven efficacy on more than 200 insect species, including ants, aphids, and beetles. Azera Pro is available through Mycorrhizal Applications LLC, a supplier of mycorrhizal soil inoculant products, as well as the master distributor of a suite of additional biological and botanical plant support products for the horticulture industry. Sentinel Biologics, a microbial technology company serving the agricultural, environmental, and energy industries, has launched its new EcoBiome soil testing technology. According to Rodriguez, soil microbiology is the catalyst to optimal plant health. Over the years, traditional fertilization, tillage practices and crop protection products have slowly stripped soils of the basic nutrient-rich organic matter and microbial balance vital for optimal soil and plant health. The advanced EcoBiome soil analysis technology provides colony counts of specific microbes capable of solubilizing locked-up nutrients and minerals in the soil. If microbial deficiencies are discovered, the EcoBiome Innovation Center will recommend and offer customized microbial products formulated to rebalance and restore the soil ecology back to optimal levels. Rodriguez sees an excellent fit for the new EcoBiome technology in the production agriculture, professional turf maintenance, and greenhouse ornamental sectors, as well as the home lawn and garden market.